The full-scale M.65 Gemini was a delightful little twin built in England right after WWII. It was built entirely of spruce and plywood, and spanned 36 feet, 2 inches. Powered by a pair of 100 hp Blackburn Cirrus Minor II engines, the Gemini offered comfortable and efficient transportation for up to four people at a max cruise of 145 miles per hour. Full fuel range was approximately 1000 miles, making it a perfect ship for touring the British Isles and the Continent. 170 aircraft were built, with many still surviving. 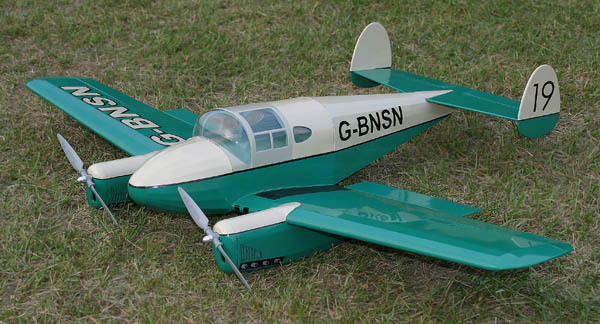 This model was built from a short-lived laser cut kit designed and sold by Keith Sterner through his company, Klass Wings. 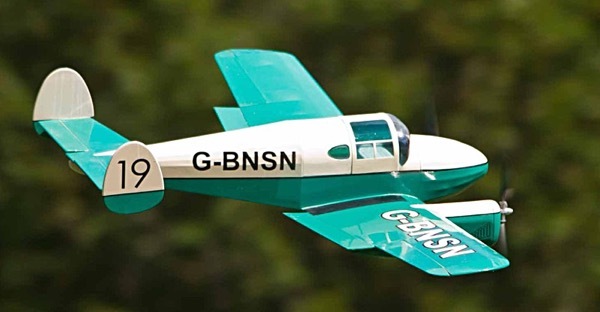 It is powered with a pair of stock 7.2v Speed 400 motors turning Graupner's 6.5x4 scale propellers. While they look the part, these propellers were poorly balanced out of the mold. I used multiple layers of black sign vinyl on the backs of the blades to both balance them and relieve the pilot's eyes with an anti-reflective coating. With full apologies to the scale police, I dressed mine in an "undocumented" scheme using SIG Aerokote Lite. 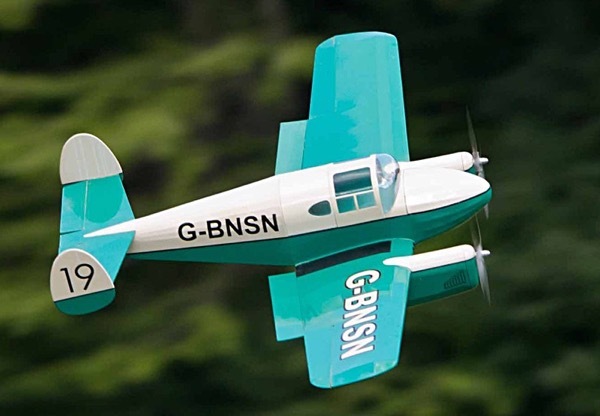 Assuming that this would be an ideal aircraft for a proper English gentleman to use for weekend touring with his lady, I tried to keep it tasteful, while still allowing that it might also go racing from time to time. 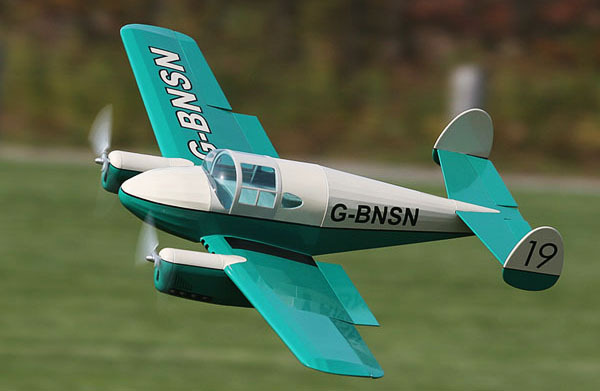 I built my model in 2005 and had a great time flying loose formation with Keith at the NEAT Fair that fall. Originally I had great plans for plug-in landing gear to save the weight of retracts. Then I realized I fly almost exclusively off grass, and already have a lot of planes for touch and goes. The only major modification I made was to the rear turtledeck. I doubled the stringer count to get the spacing more in line with those on the nose. I also replaced the vacuum formed nose bowls with ones made from balsa, for a better fit and to use the same covering for a perfect color match. It is a shame that this kit is gone, but motivated builders will find that the plans remain available as #2105 from RC Sport Flyer and Kiona Publishing. Finally, some more flight photos! A special thanks to Terry Dunn for these two flight photos of the Gemini, taken 13 years after her first flight. I dusted her off for another appearance at the NEAT Fair, and logged a nice flight on Saturday afternoon. She has been idle for a few years, but showed her spirit again quite respectably. Indeed, once we made a lap or two, I was reminded why I like this model so much. It carves through turns beautifully, and looks great slipping by, as if running off above the British Isles for another weekend adventure, or making a quick jump across the channel to the continent. After every outing I muse that I really should fly the Gemini more, and wonder if a larger version, say around 60 inches, might even be that much better. But then I think about how elegantly simple this model is, and how easily it drops in the car. No question, Keith got this one just right. Wing Span: . 40 in.